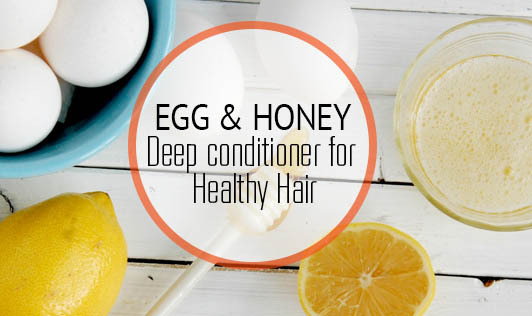 If you’re worried about excessive dandruff and hair fall, you should definitely try this homemade conditioner made from egg, honey, and olive oil. The eggs provide shine to the hair, honey helps treat damaged hair, and olive oil conditions the hair. Eggs are packed with nutrients like vitamin A, B, D, and E that are essential for strengthening and making hair shiny. Vitamin A helps in sebum production, thus helping you prevent dandruff. It also helps to prevent hair loss. Vitamin B plays a vital role in supplying oxygen to the scalp, thus improving circulation to the hair. Vitamin D not only strengthens the hair but also fights against hair loss. Vitamin E adds the much-needed moisture to the scalp and provides shine to the hair. Fatty acids in eggs give them strength from the roots, prevent hair loss, and make hair more lustrous. Protein is responsible for making hair stronger and voluminous. Honey acts as a natural antiseptic and antibacterial ingredient and resolves the problem of a sensitive scalp. It prevents itching and flakiness by adding moisture to the lifeless hair. Olive oil is loaded with vitamin E. Vitamin E moisturizes the scalp and deep cleanses it from within and solves the problem of itchy scalp. Mix honey and olive oil together and microwave for 30 seconds. Add the eggs to the warm mixture and whisk it with a beater thoroughly, so that all the ingredients get mixed well. Divide your hair into different segments and apply the mixture gently on your scalp.